Despite the warning to turn the heat down, not everyone decided to do so. 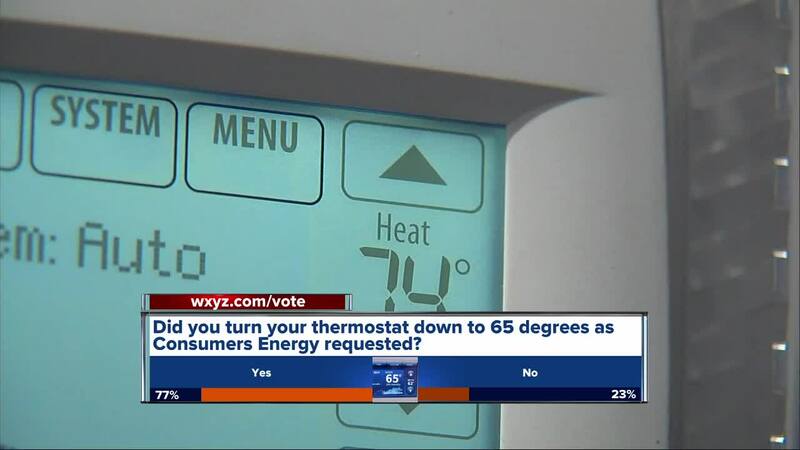 DETROIT (WXYZ) — Despite the warning to turn the heat down, not everyone decided to do so. “It’s extremely cold outside, even if we turned it down to 65 we would still freeze – it was so cold,” said Shovanna Shackleford of Detroit. She says she got the alert on her phone Wednesday night, but didn’t know it was because of a fire at the Consumers Energy Ray Plant causing concern over whether there would be enough gas to heat everyone's home. “I didn’t know what the emergency was for but I definitely know that now that it was is over a fire," Schackleford said. "I will definitely turn my heat down." Stacey Mango also left her thermostat up because she didn’t understand what the emergency alert on her phone Wednesday night was all about. “You going to freeze me outside and in the inside," Margo asked. She said that it was after she learned about the fire that she said she would have complied. "I thought about it, maybe this is a warning for everybody because what if we don’t have nothing,” Mango said. Others just couldn’t bring themselves to turn the heat down despite knowing what the alert was for. “As long as it’s cold its going to stay up,” said Reginald Gordy of Detroit. "If anything, I cut it down to 70, but this 65 – no, I got too many people in my house to do that.” said Trez Myer. However, some did take the warning seriously. “We watched the news after I got the message, so it made sense to add a blanket – no big deal,” said Rene Reiter of Ferndale. All jokes aside, he did turn down the temperature in his home.